Fancy Food Show Spotlight on Traina Foods Sun Dried Tomato Ketchup! A few months ago, I attended The Fancy Food Show at The Javits Center in New York, and I haven't stopped talking about it since! There were so many wonderful foods to try, and so many things I vowed to share with my readers because I think you would love them, too. I've been highlighting some of my favorites and hope to do so for the next few months. Today I want to tell you about Traina Foods. And no, this is not a sponsored post or an ad, it's just something cool that I want to share with you because I think you'll like it. Traina Foods is a family owned company that produces sun-dried fruits in California. High quality, sun-dried fruits! And that's what they use to make their amazing sun dried tomato ketchup. I saw a wonderful trend at The Fancy Food Show of companies using more natural ingredients, non-GMO's, and going back to basic, natural flavor. I just love that. Traina Foods is the perfect example of how something natural can taste totally delicious. Their ketchups come in two flavors: hot sriracha and California sun dried tomato. Before The Fancy Food Show, I was sent a sample of Traina Foods Sun Dried Tomato Ketchup. They assured me it was so good, that I would even love it on hot dogs. This immediately made me chuckle because I thought, No way. I am a mustard girl, 100%. But I have to admit, it was pretty darned good on a hot dog. My favorite way to eat it, though, is on a plain hamburger. I usually prefer cheeseburgers, but my new summer favorite is a plain burger smothered in sun dried tomato ketchup. How Else Can I Use Sun Dried Tomato Ketchup? The good people at Traina provided me with this handy dandy chart of ways I can use their product (you can print one of these out from their site). You can also look on their Facebook page or their website for more ideas. I also saw an idea on their Instagram page that I can't wait to try. 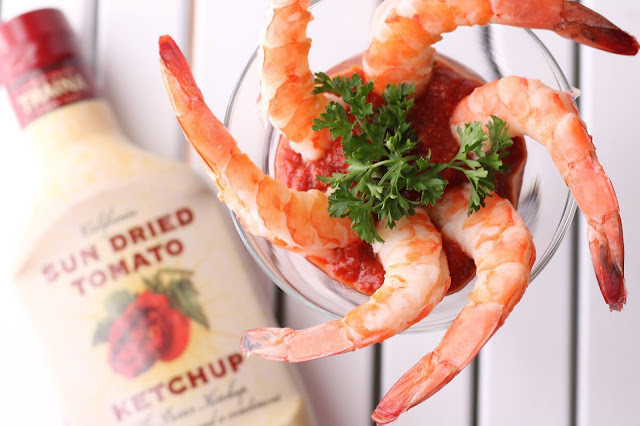 You can make your own cocktail sauce for shrimp with their sun dried tomato ketchup! Where Can I Find Traina Foods Products? You can purchase Traina Foods sun dried tomato ketchup right from their website, or find them at a retailer near you. You can also use their store locator online. Disclaimer: I received free bottles of Traina Foods sun dried tomato ketchup but that did not influence my opinion in this post. I am sharing with you because I love you and I want you to eat good things. If you liked this post, check out my other articles from The Fancy Food Show, including my Spotlight on Hoboken Farms, Frozen Treats to Try This Summer, and Snacks to Liven Up Your Lunchbox! It's always fun finding new foods and products that I actually like. Thanks, Mary! I totally agree! !